It takes time...to mine the depths of your child's heart.It takes time...to confess, repent, and forgive within marriage. It takes time...to listen to the answers to the questions you ask. It takes time...to say "I'm sorry," and really express it. It takes time...to pray. It takes time...to prioritize good health. It takes time...to put as much into a relationship as you want to receive. It takes time...to tend to any garden. It takes time...to stand behind the things you say instead of muttering them under your breath. It takes time...to pursue your spouse. It takes time...to determine a course instead of a course determining you. It takes time...to replace bad habits with good. It takes time...to not just talk about feasting in the Word, but to actually read it. I don't mean "it takes time" in that change comes slowly (it may!) but that things that matter require a sacrifice of time. Time that you can't find. Time that seems to slip away. Time that's occupied by all the must-do's in life. But if your list is like mine...can you afford NOT to make time? Deep relationships, maturity and growth, a disciplined life...these things do not just happen. Not all investment of time is equal. Time spent worrying or complaining about what isn't, never has a positive return. You never make interest on worry; the more you worry or complain, the less you gain. 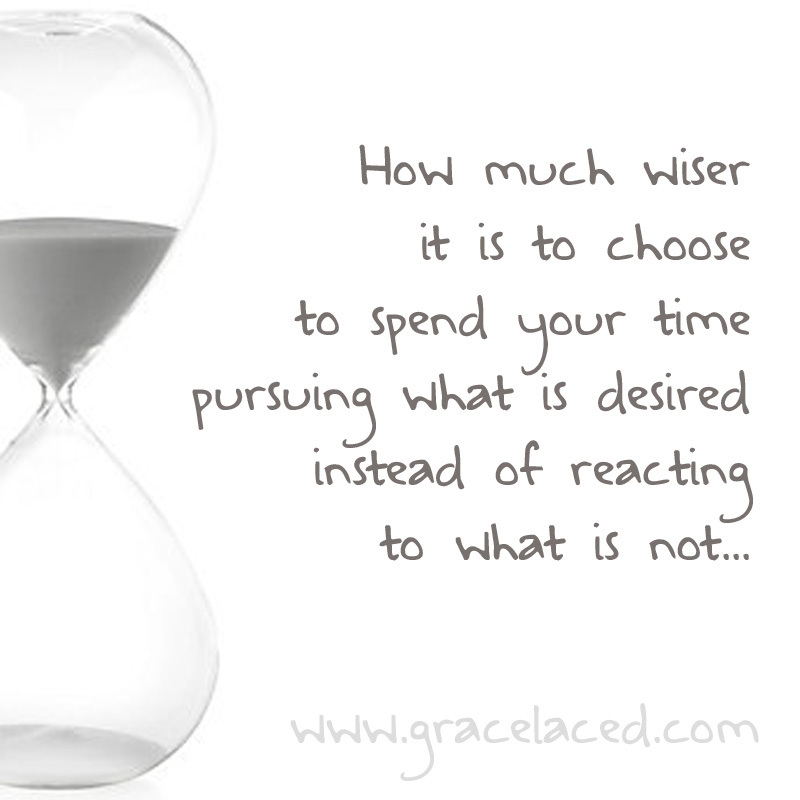 How much wiser it is to choose to spend your time pursuing what is desired instead of reacting to what is not. I have 24 hours, as do you. I have no more time now than I had in the past; but lately, I'm ruthlessly editing all that yields diminishing returns to make room for what is worthy of time. It continues to be true: We demonstrate what is important to us by what we make time for. If I want real conversations with my kids, I have to make time. If I want my husband to know my heart, I must prioritize time to make it accessible. If I want to know my Savior more deeply, I have to sow seeds of time. If I want to become more tomorrow than I was yesterday, I need to invest today's time more wisely. The only time I have to spend is the time that is still to come. I can't reassign past moments or re-prioritize yesterday's minutes and hours. But, today is tomorrows's yesterday, so I can choose what to spend my time valuing before those choices are made for me. Before time slips away. Before time is diced and spliced, and found insufficient tomorrow. I can determine to be wise with tomorrow's time. And perhaps you, too, are taking inventory of what you value most...and it's about time. *Please link up your post, not your blog's home address. *Visit the other links and leave a comment--everyone loves comment love!